This sport of a dwarf variegated cultivar was registered by Eldren Minks of Minnesota in 1970. It has also been known by the names, H. 'Dwarf Grey Leaf', H. 'Gray Leaf Dwarf' and 'Small Grey Leaf' over the years. It appears to be an H. 'Tokudama' type of hosta that grows into a medium size hosta about 16 inches tall and spreads to 39 inches wide. The ovate shaped leaves are deeply lobed at the base and a slight waviness in the margins. Funnel shaped, pale lavender flowers bloom in July. According to The Hostapedia by Mark Zilis (2009), "...some similarities in foliage and flower to 'Fortunei Hyacinthina', but in a smaller size. 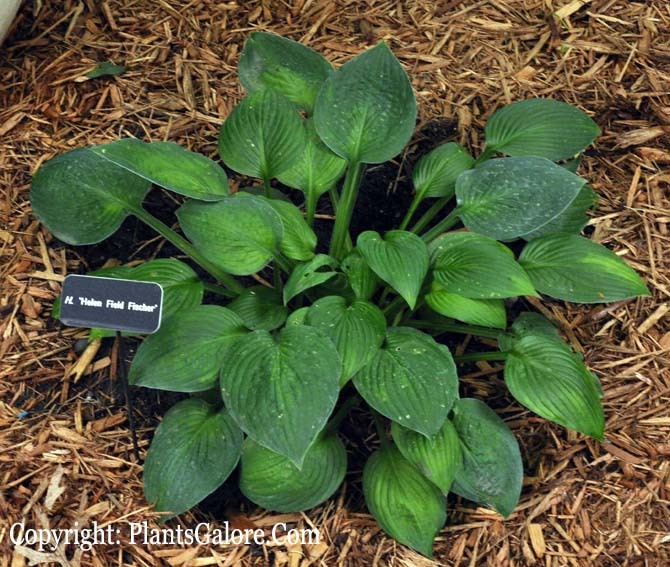 Helen Field Fischer was a well-known radio show host in the Midwest and the mother of one of the early hosta enthusiasts, Gretchen Harshbarger of Iowa." She was the "star" of the daily show, “Garden Club of the Air” starting in the 1920s. Helen was a well known daylily enthusiast and started the Hemerocallis Round Robin. Similar cultivars include H. 'Peter Pan'. H. 'Helen Field Fisher' (1970) – was registered with a typographical error and should have been registered as H. 'Helen Field Fischer'.